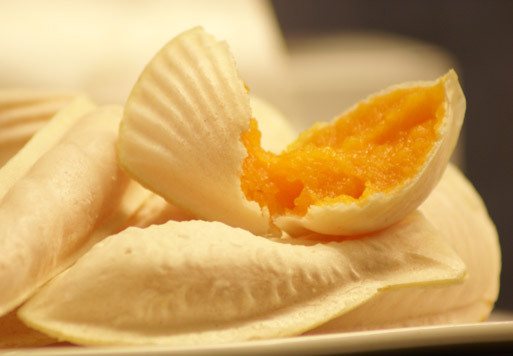 We are going to show you how to make Ovos Moles de Aveiro, which are Portuguese egg yolk sweets. 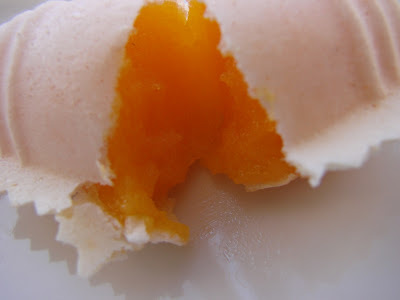 These are one of the most identifiable treats unique to Portuguese dessert making. They are seen at any dessert shop or any event and are perfect for those with a sweet tooth like myself. The smooth texture and sweet flavor of the yolk in the crunchy shell makes for quite an enjoyable treat. This dessert is sure to impress and quite simple and easy to make. 1) Pour the ingredients in a bowl and knead them well until they reach a dough like consistency. 2) With the help of a rolling pin, roll the dough very thin, place it in a lightly greased form and with the tip of a knife, make the shape you wish to mold the filling in. The dough should be very thin, almost transparent. 3) Mold the dough into whichever shape you please, or if you have a specific baking mold, use that. 1) Pour the sugar in a saucepan on the stove with a glass of water and let it boil until 245 degrees fanrenheit or the sugar has become a syrup with an even consistency. 2) In another saucepan, dissolve the rice flour in 1/2 cup of cold water. Add the boiled sugar syrup to this mixture let it cook on low heat for 5 minutes. 3) Turn off the heat and let it cool slightly and begin adding in the egg yolks. 4) Keep stirring them together and let them cool for another 5 minutes on low heat in the saucepan. 5) Pour the filling into the molded shells. Hy,how much Milliliter is one cup? Hi! One cup is usually about 250ml .